This Thursday at Edinburgh’s HMV Picturehouse Music Like A Vitamin is back after a years hiatus to promote the Scottish Mental Health Arts and Film Festival. This years stellar line-up includes Fruit Tree Foundation founder Rod Jones band The Birthday Suit, Sparrow & The Workshop, Fatherson and Withered Hand all for the price of a fish supper. 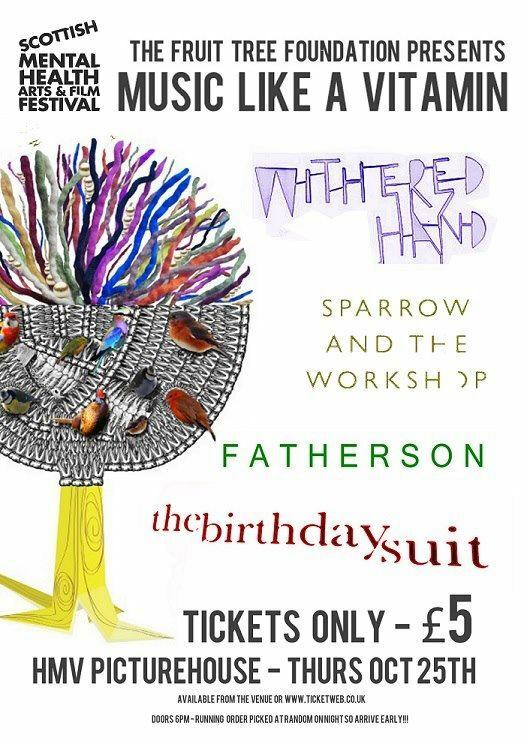 So please make your way down on Thursday if you can, its a great cause and will definitely be a great night of live music, check out the ticket links below or they will also still be available on the door on the night.